To throw hard an athlete forcefully rotates their shoulder, putting significant strain on the ligaments and rotator cuff muscles. For throwers a “loose” shoulder is often ideal, but this can also lead to instability. Numerous parts of the shoulder are utilized and strained while throwing: the rotator cuff, the glenoid, the ligaments, the labrum, and the biceps. Athletes often develop tendinitis in the shoulder or elbow as the rotator cuff or biceps tendons get inflamed and swollen. This is caused by the intense usage. Symptoms include pain, heightened while the arm is cocked and in the beginning stages of a throw. With biceps tendonitis, you may feel pain in the front of the shoulder. Pressure in the area of the biceps will cause pain. Use of the arm while reaching for a shelf or fastening a seat belt may also cause pain. Treatment includes ice, rest, stretching, and anti-inflammatory medication. Surgery is typically not required. If there is underlying instability as well the symptoms might not improve and surgery might be necessary to ultimately relieve pain. Tenodesis of the biceps: (arthroscopic or open) The tendon is removed from the bicipital groove by detaching it from the top of the socket at the superior labrum. It is then fixed into the humerus bone outside so it cannot move over the shoulder joint. 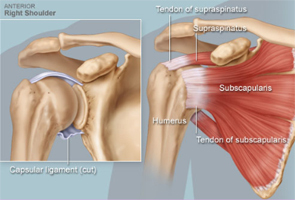 This procedure is usually curative of pain and it does not compromise shoulder function. 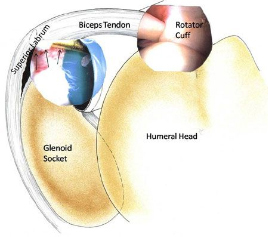 The rotator cuff consists of four muscles that connect from the scapula to the humerus bone and form a cuff around the ball and socket. These muscles help the ball move on the socket, but also compress the ball into the socket to maintain a stable fulcrum for rotation when the shoulder moves. If the RC is over-stressed it will tear, similar to a rope fraying. Physical therapy treatment including stretching and strengthening of the affected muscles and tendons may help. Anti-inflammatory medication may also be recommended. If there is substantial arthritis or an un-repairable rotator cuff tear, a shoulder replacement may be indicated. 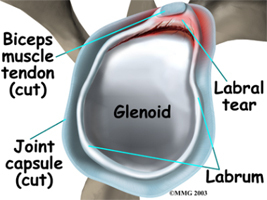 The labrum is a ring of cartilage that surrounds the socket (glenoid) of the shoulder. It helps stabilize the shoulder and acts as an attachment point for many ligaments. Tears in the labrum for overhead athletes can result in “microinstability,” which is abnormal motion of the ball on the socket resulting in pain with throwing. 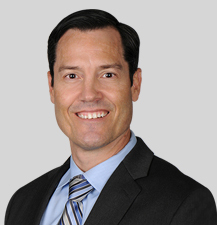 First line treatment is rehabilitation and/or arthroscopic repair of the torn labrum. A sudden pull of the biceps from a fall or lifting a heavy object can detach the superior labrum that sits at the top of the glenoid socket with the biceps running through it. 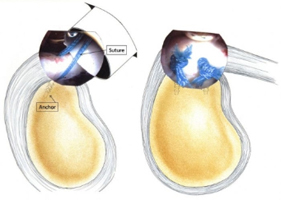 The lesion can develop in the cocking phase. 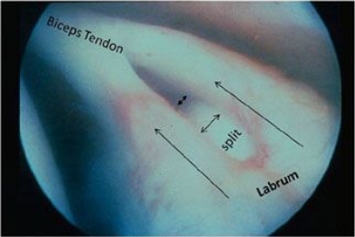 Repeated cocking causes internal impingement and a peeling back of the labrum that occurs when the rotator cuff contacts the labrum abnormally. If a piece of labrum is torn off it may also get stuck between the ball and socket. This is most noticeable during rotational movements. This lesion can result in pain while using your arm in the front of your body, or an audible clicking and popping in the shoulder. A feeling of shifting and instability of the shoulder may also occur. 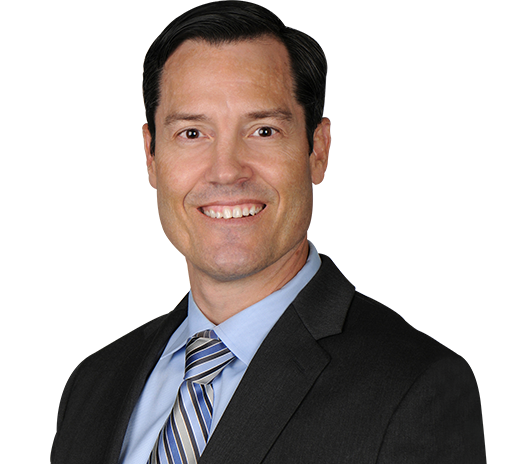 When therapy or conservative treatment fails arthroscopic repair is necessary by placing an anchor underneath the lesion in the bone. These sutures are then brought through the labrum which is pulled back against the bone, allowing it to heal in place. Patients can go home the same day, but the arm is kept in a sling for 4 weeks. Physical therapy will begin one week after.